The students had also been asked what grade they thought they would get, and it turned out that levels of trust in those students whose actual grades hit or exceeded that estimate were unaffected by transparency. But people whose expectations were violated – students who received lower scores than they expected – trusted the algorithm more when they got more of an explanation of how it worked. This was interesting for two reasons: it confirmed a human tendency to apply greater scrutiny to information when expectations are violated. And it showed that the distrust that might accompany negative or disappointing results can be alleviated if people believe that the underlying process is fair. This article uses the example of algorithmic grading of student work to discuss issues of trust and transparency. One of the findings I thought was a useful takeaway in this context is that full transparency may not be the goal, but that we should rather aim for medium transparency and only in situations where students’ expectations are not met. For example, a student who’s grade was lower than expected might need to be told something about how it was calculated. But when they got too much information it eroded trust in the algorithm completely. When students got the grade they expected then no transparency was needed at all i.e. they didn’t care how the grade was calculated. For developers of algorithms, the article also provides a short summary of what explainable AI might look like. For example, without exposing the underlying source code, which in many cases is proprietary and holds commercial value for the company, explainable AI might simply identify the relationships between inputs and outcomes, highlight possible biases, and provide guidance that may help to address potential problems in the algorithm. Two weeks ago I presented some of my thoughts on the implications of AI and machine learning in clinical practice and health professions education at the 2018 SAAHE conference. Here are the slides I used (20 slides for 20 seconds each) with a very brief description of each slide. This presentation is based on a paper I submitted to OpenPhysio, called: “Artificial intelligence in clinical practice: Implications for physiotherapy education“. The graph shows how traffic to a variety of news websites changed after Facebook made a change to their Newsfeed algorithm, highlighting the influence that algorithms have on the information presented to us, and how we no longer really make real choices about what to read. 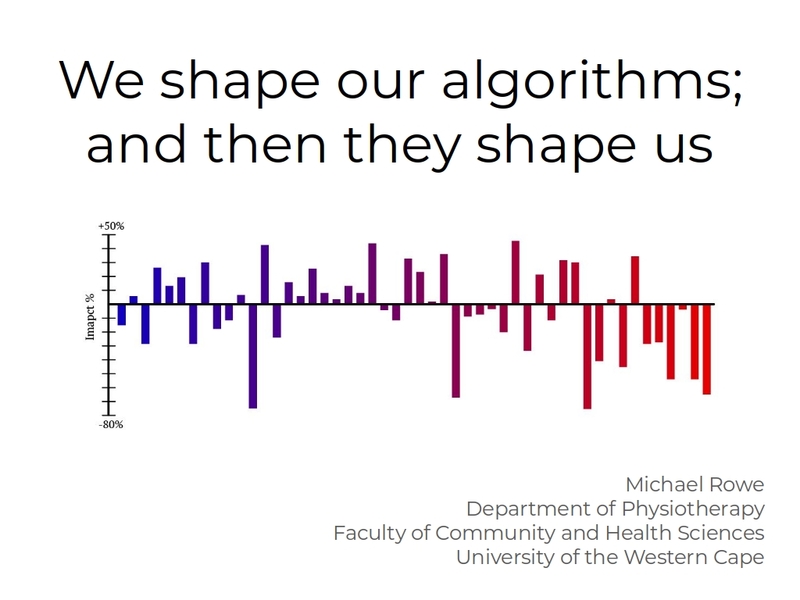 When algorithms are responsible for filtering what we see, they have power over what we learn about the world. 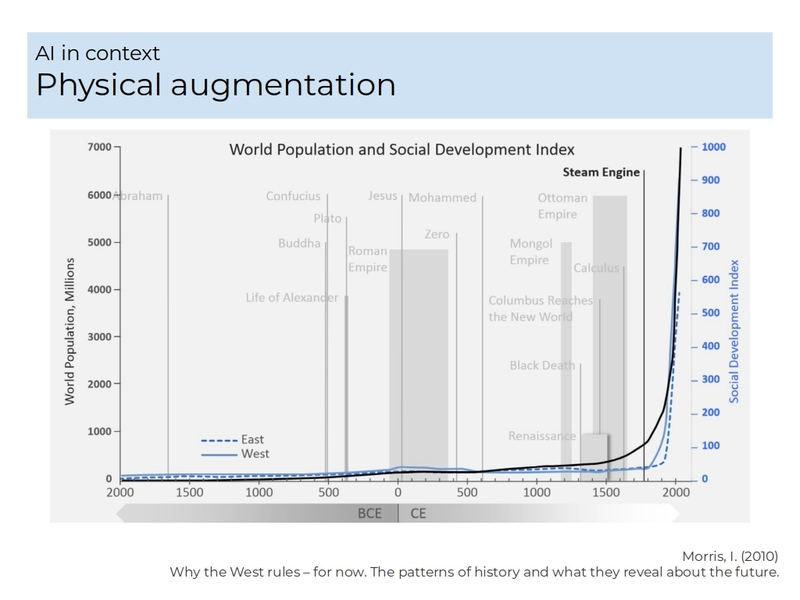 The graph shows the near flat line of social development and population growth until the invention of the steam engine. Before that all of the Big Ideas we came up with had relatively little impact on our physical well-being. If your grandfather spent his life pushing a plough there was an excellent chance that you’d spend your life pushing one too. But once we figured out how to augment our physical abilities with machines we saw significant advances in society and industry and an associated improvement in everyones quality of life. 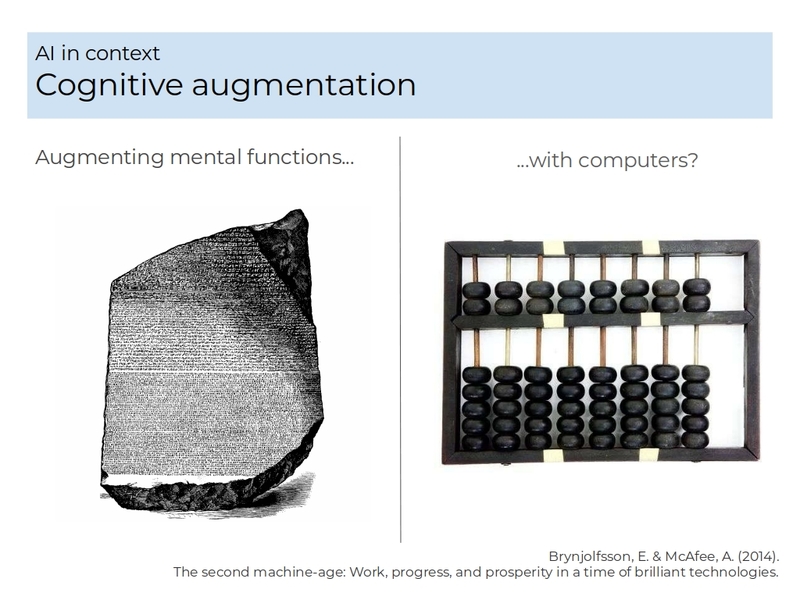 The emergence of artificial intelligence in the form of narrowly constrained machine learning algorithms has demonstrated the potential for important advances in cognitive augmentation. Basically, we are starting to really figure out how to use computers to enhance our intelligence. However, we must remember that we’ve been augmenting our cognitive ability for a long time, from exporting our memories onto external devices, to performing advanced computation beyond the capacity of our brains. The enthusiasm with which modern AI is being embraced is not new. The research and engineering aspects of artificial intelligence have been around since the 1950s, while fictional AI has an even longer history. The field has been through a series of highs and lows (called AI Winters). 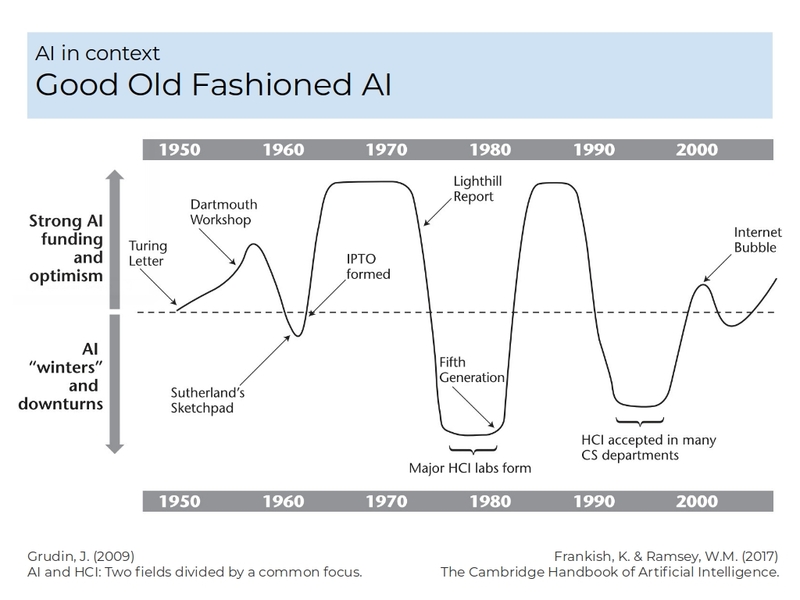 The developments during these cycles were fueled by what has become known as Good Old Fashioned AI; early attempts to explicitly design decision-making into algorithms by hard coding all possible variations of the interactions in a closed-environment. Understandably, these systems were brittle and unable to adapt to even small changes in context. This is one of the reasons that previous iterations of AI had little impact in the real world. There are 3 main reasons why it’s different this time. The first is the emergence of cheap but powerful hardware (mainly central and graphics processing units), which has seen computational power growing by a factor of 10 every 4 years. 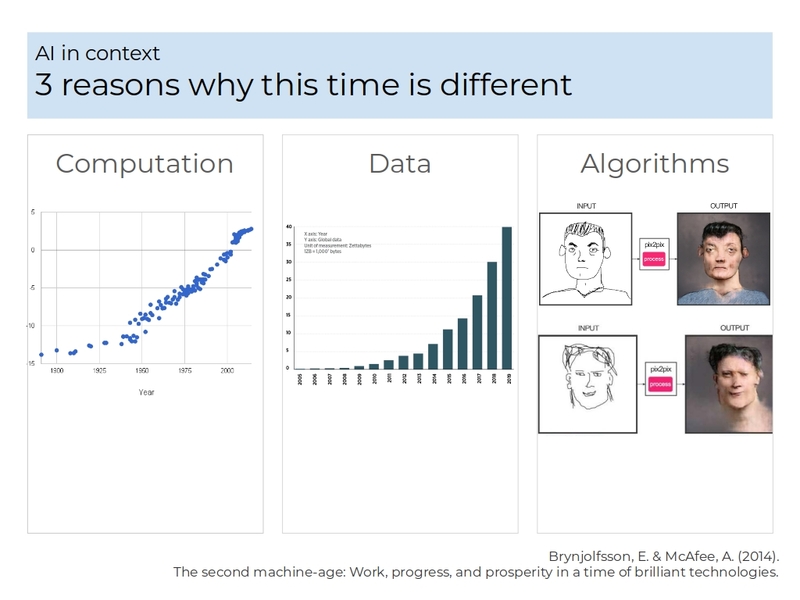 The second characteristic is the exponential growth of data, and massive data sets are an important reason that modern AI approaches have been so successful. The graph in the middle column is showing data growth in Zettabytes (10 to the power of 21). At this rate of data growth we’ll run out metric system in a few years (Yotta is the only allocation after Zetta). The third characteristic of modern AI research is the emergence of vastly improved machine learning algorithms that are able to learn without being explicitly told what to learn. In the example here, the algorithm has coloured in the line drawings to create a pretty good photorealistic image, but without being taught any of the concepts i.e. human, face, colour, drawing, photo, etc. We’re increasingly seeing evidence that in some very narrow domains of practice (e.g. reasoning and information recall), machine learning algorithms can outdiagnose experienced clinicians. It turns out that computers are really good at classifying patterns of variables that are present in very large datasets. And diagnosis is just a classification problem. For example, algorithms are very easily able to find sets of related signs and symptoms and put them into a box that we call “TB”. And increasingly, they are able to do this classification better than the best of us. It is estimated that up to 60% of a doctors time is spent capturing information in the medical record. 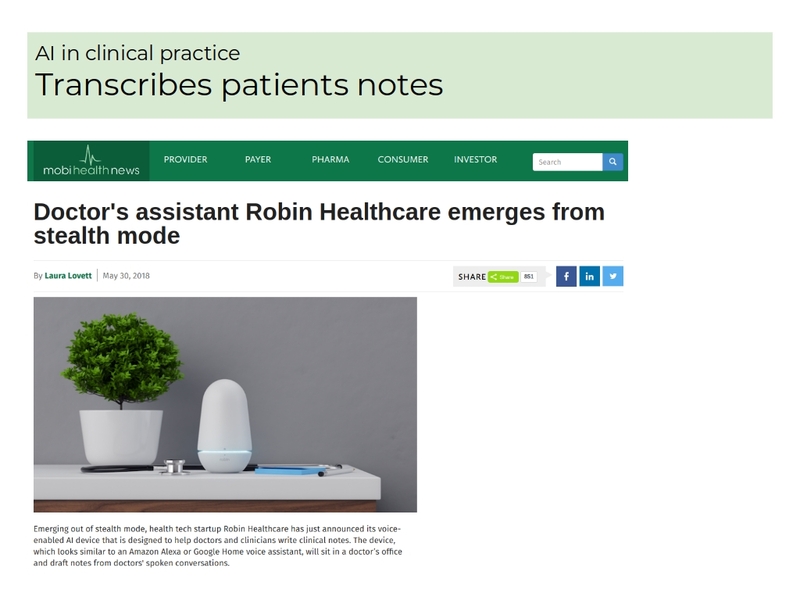 Natural language processing algorithms are able to “listen” to the ambient conversation between a doctor and patient, record the audio and transcribe it (translating it in the process if necessary). 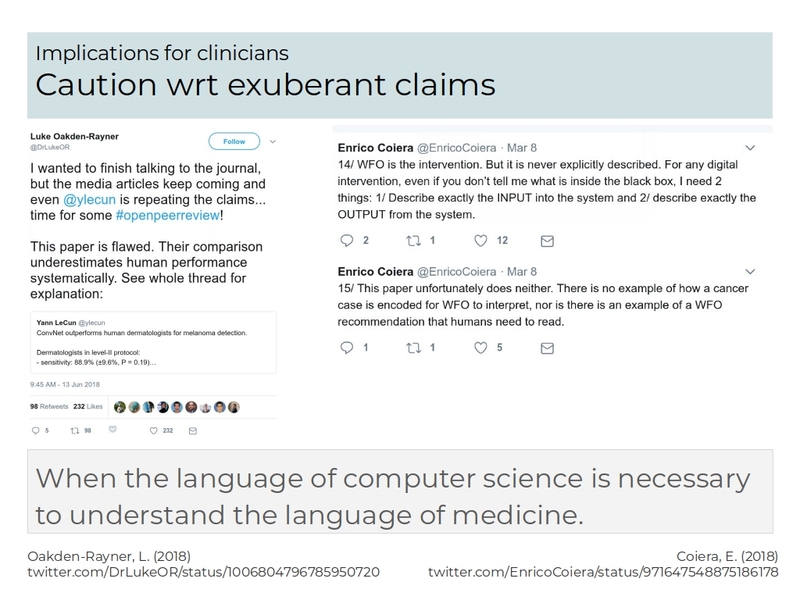 It then performs semantic analysis of the text (not just keyword analysis) to extract meaningful information which it can use to populate an electronic health record. While the technology is in a very early phase and not yet safe for real world application it’s important to remember that this is the worst it’s ever going to be. Even if we reach some kind of technological dead end with respect to machine learning and from now on we only increase efficiency, we are still looking at a transformational technology. An algorithm recently passed the Chinese national medical exam, qualifying (in theory) as a physician. While we can argue that practising as a physician is more than writing a text-based exam, it’s hard not to acknowledge the fact that – at the very least – machines are becoming more capable in the domains of knowledge and reasoning that characterise much of clinical practice. Again, this is the worst that this technology is ever going to be. This graph shows the number of AI applications under development in a variety of disciplines, including medicine (on the far right). 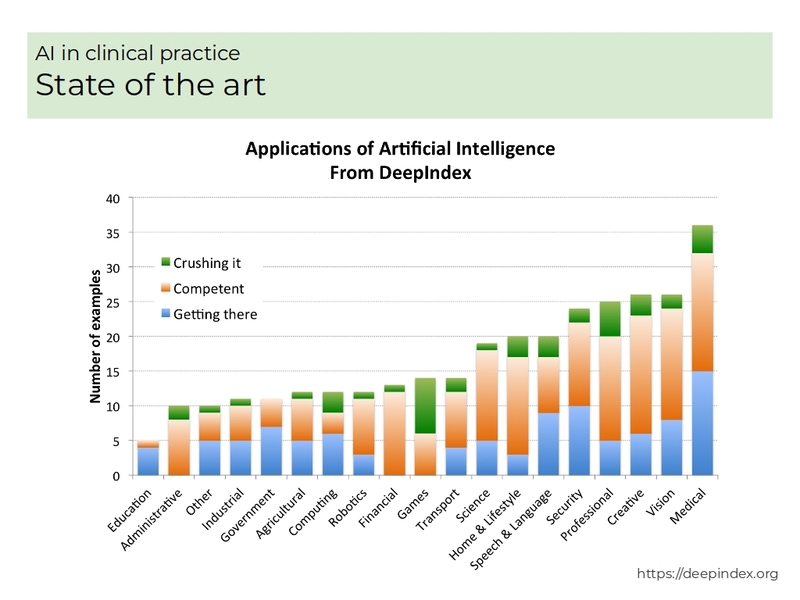 The green segment shows the number of applications where AI is outperforming human beings. Orange segments show the number of applications that are performing relatively well, with blue highlighting areas that need work. There are two other points worth noting: medical AI is the area of research that is clearly showing the most significant advances (maybe because it’s the area where companies can make the most money); and all the way at the far left of the graph is education, showing that there may be some time before algorithms are showing the same progress in teaching. 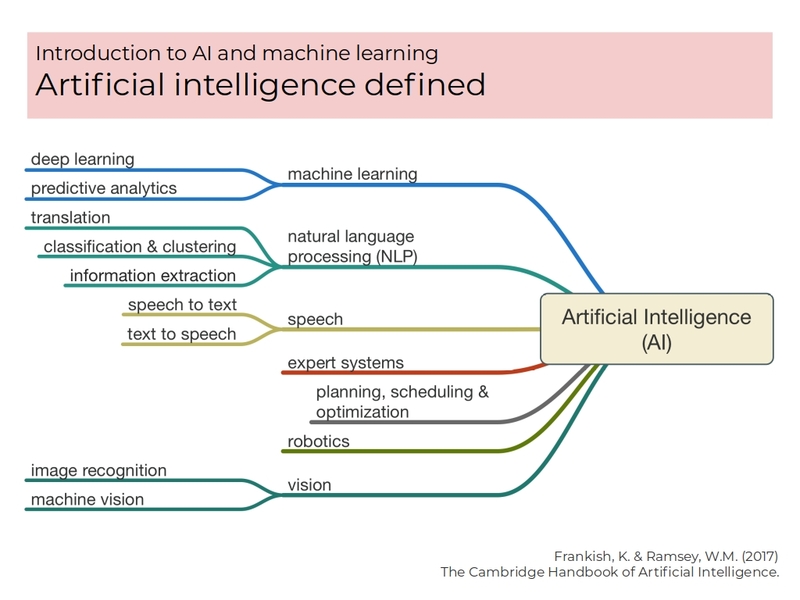 Contrary to what we see in the mainstream media, AI is not a monolithic field of research; it consists it consists of a wide variety of different technologies and philosophies that are each sometimes referred to under the more general heading of “AI”. While much of the current progress is driven by machine learning algorithms (which is itself driven by the 3 characteristics of modern society highlighted earlier), there are many areas of development, each of which can potentially contribute to different areas of clinical practice. 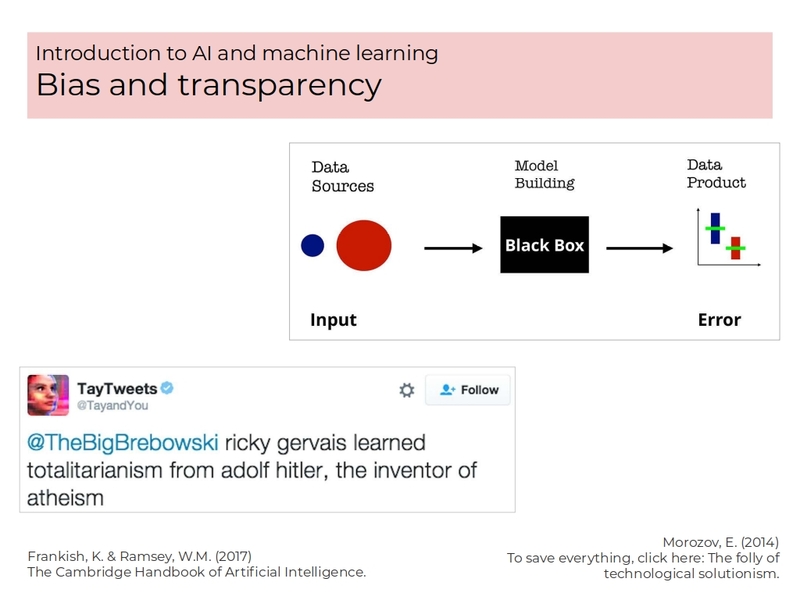 For the purposes of this presentation, we can define AI as any process that is able to independently achieve an objective within a narrowly constrained domain of interest (although the constraints are becoming looser by the day). Machine learning is a sub-domain of AI research that works by exposing an algorithm to a massive data set and asking it to look for patterns. By comparing what it finds to human-tagged patterns in the data, developers can fine-tune the algorithm (i.e. “teach it) before exposing it to untagged data and seeing how well it performs relative to the training set. This generally describes the “learning” process of machine learning. 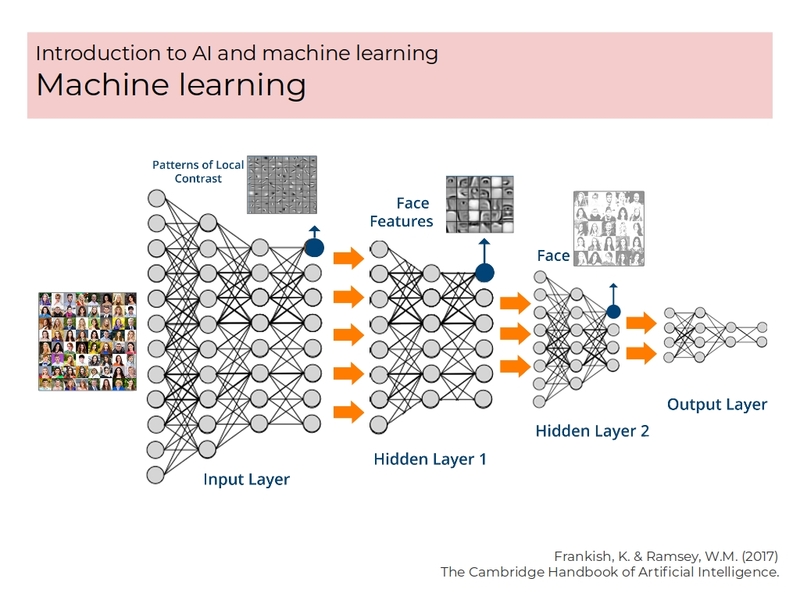 Deep learning is a sub-domain of machine learning that works by passing data through many layers, allocating different weights to the data at each layer, thereby coming up with a statistical “answer” that expresses an outcome in terms of probability. Deep learning neural networks underlie many of the advances in modern AI research. Because machine and deep learning algorithms are trained on (biased) human-generated datasets, it’s easy to see how the algorithms themselves will have an inherent bias embedded in the outputs. The Twitter screenshot shows one of the least offensive tweets from Tay, an AI-enabled chatbot created by Microsoft, which learned from human interactions on Twitter. In the space of a few hours, Tay became a racist, sexist, homophobic monster – because this is what it learned from how we behave on Twitter. This is more of an indictment of human beings than it is of the algorithm. The other concern with neural networks is that, because of the complexity of the algorithms and the number of variables being processed, human beings are unable to comprehend how the output was computed. 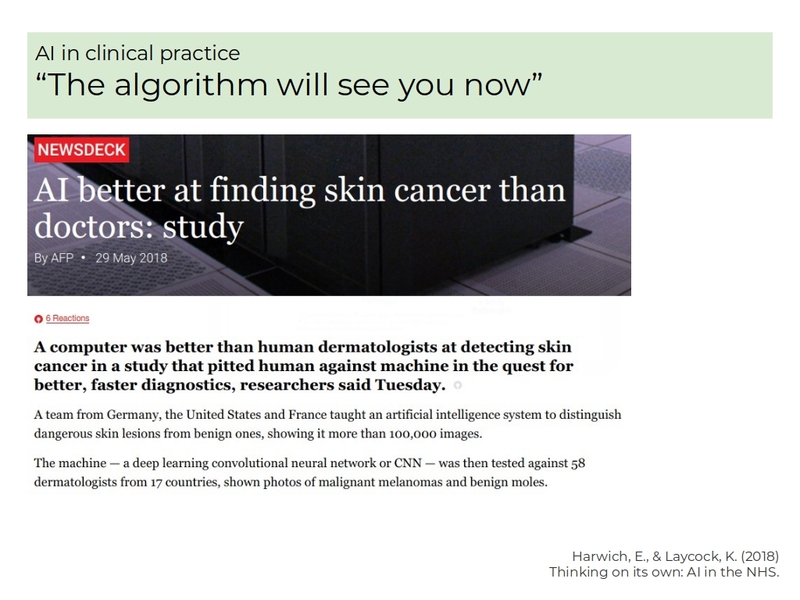 This has important implications when algorithms are helping with clinical decision-making and is the reason that resources are being allocated to the development of what is known as “explainable AI”. 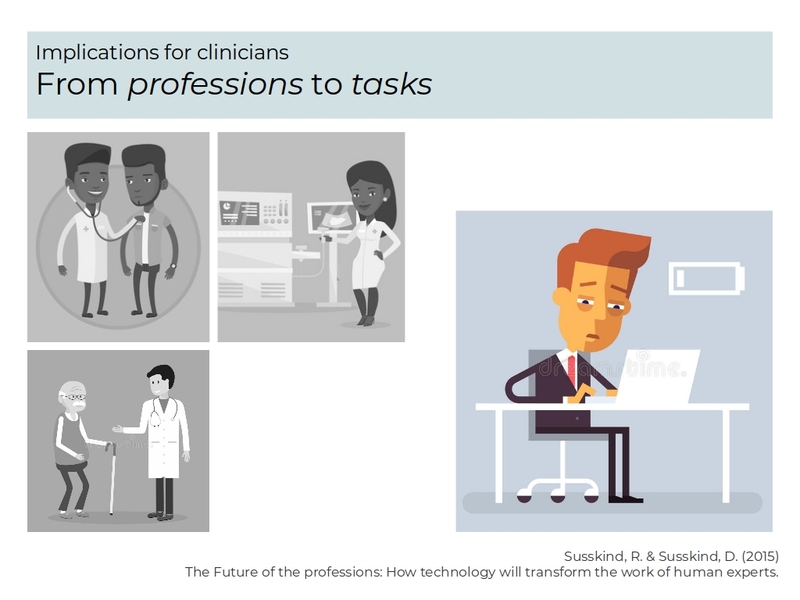 As a result of the changes emerging from AI-based technologies in clinical practice we will soon need to stop thinking of our roles in terms of “professions” and rather in terms of “tasks”. 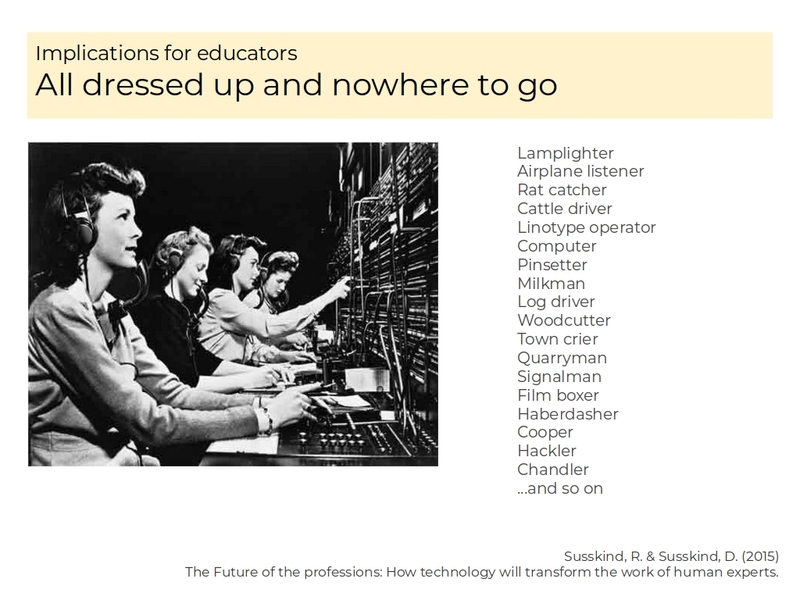 This matters because increasingly, many of the tasks we associate with our professional roles will be automated. This is not all bad news though, because it seems probable that increased automation of the repetitive tasks in our repertoire will free us up to take on more meaningful tasks, for example, having more time to interact with patients. We need to start asking what are the things that computers are better at and start allocating those tasks to them. Of course, we will need to define what we mean by “better”; more efficient, more cost-effective, faster, etc. Another important change that will require the use of AI-based technologies in clinical practice will be the inability of clinicians to manage – let alone understand – the vast amount of information being generated by, and from, patients. 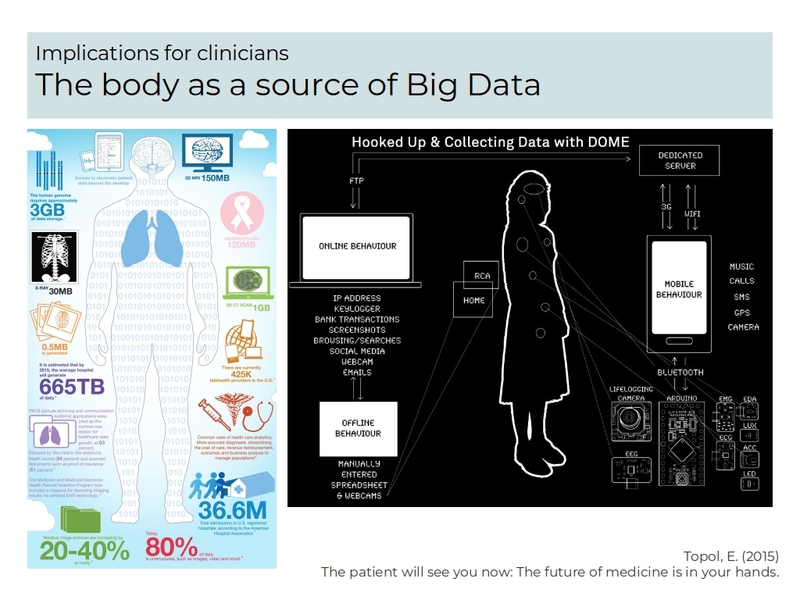 Not only are all institutional tests and scans digital but increasingly, patients are creating their own data via wearables – and soon, ingestibles – all of which will require that clinicians are able to collect, filter, analyse and interpret these vast streams of information. There is evidence that, without the help of AI-based systems, clinicians simply will not have the cognitive capacity to understand their patients’ data. The impact of more patient-generated health data is that we will see patients being in control of their data, which will exist on a variety of platforms (cloud storage, personal devices, etc. ), none of which will be available to the clinician by default. This means that power will move to the patient as they make choices about who to allow access to their data in order to help them understand it. 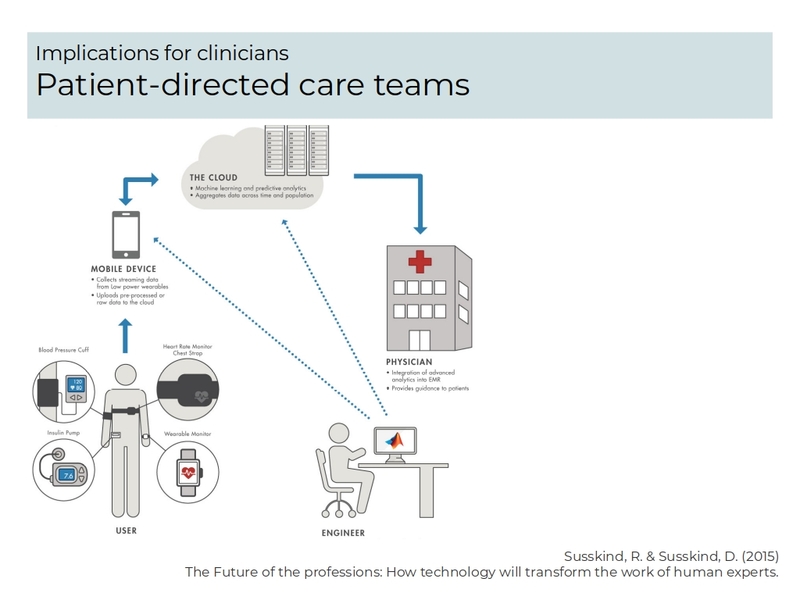 Clinicians will need to come to terms with the fact that they will no longer wield the power in the relationship and in fact, may need to work within newly constituted care teams that include data scientists, software engineers, UI designers and smart machines. And all of these interactions will be managed by the patient who will likely be making choices with inputs from algorithms. The incentives for enthusiastic claims around developments in AI-based clinical systems are significant; this is an acdemic land grab the likes of which we have only rarely experienced. The scale of the funding involved puts pressure on researchers to exaggerate claims in order to be the first to every important milestone. This means that clinicians will need to become conversant with the research methods and philosophies of the data scientists who are publishing the most cutting edge research in the medical field. The time will soon come when it will be difficult to understand the language of healthcare without first understanding the language of computer science. The implications for health professions educators are profound, as we will need to start asking ourselves what we are preparing our graduates for. When clinical practice is enacted in an intelligent environment and clinicians are only one of many nodes in vast information networks, what knowledge and skills do they need to thrive? 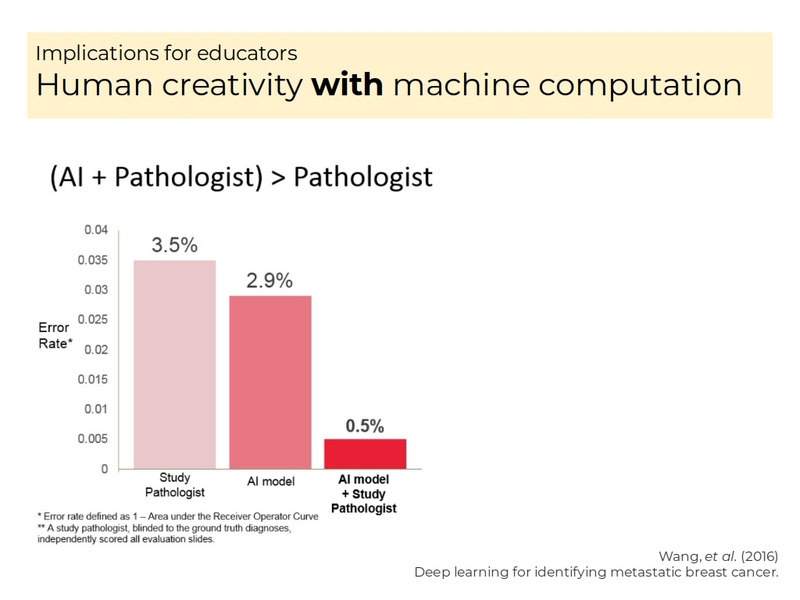 When machines outperform human beings in knowledge and reasoning tasks, what is the value of teaching students about disease progression, for example? We may find ourselves graduating clinicians who are well-trained, competent and irrelevant. It is not unreasonable to think that the profession called “doctor” will not exist in 25 years time, having been superseded by a collective of algorithms and 3rd party service providers who provide more fine-grained services at a lower cost. 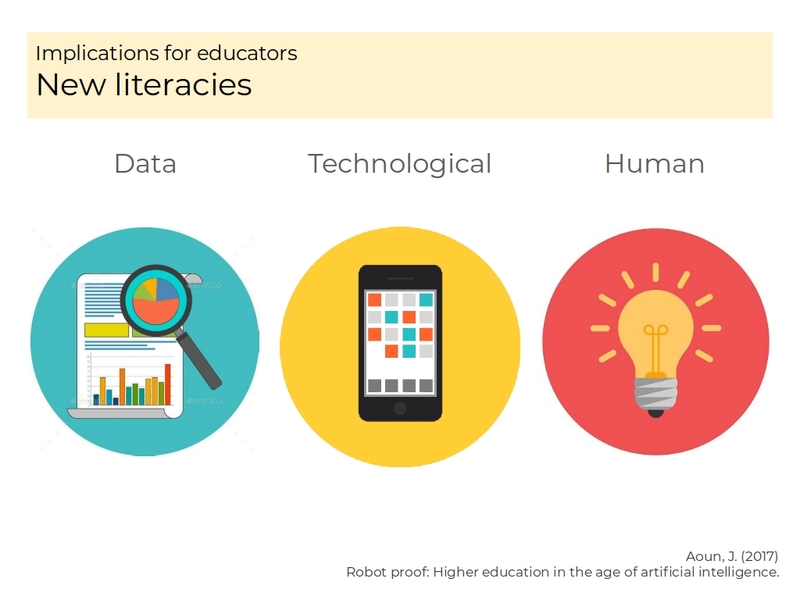 There are three new literacies that health professions educators will need to begin integrating into our undergraduate curricula. Data literacy, so that healthcare graduates will understand how to manage, filter, analyse and interpret massive sets of information in real-time; Technological literacy, as more and more of healthcare is enacted in digital spaces and mediated by digital devices and systems; and Human literacy, so that we can become better at developing the skillsets necessary to interact more meaningfully with patients. 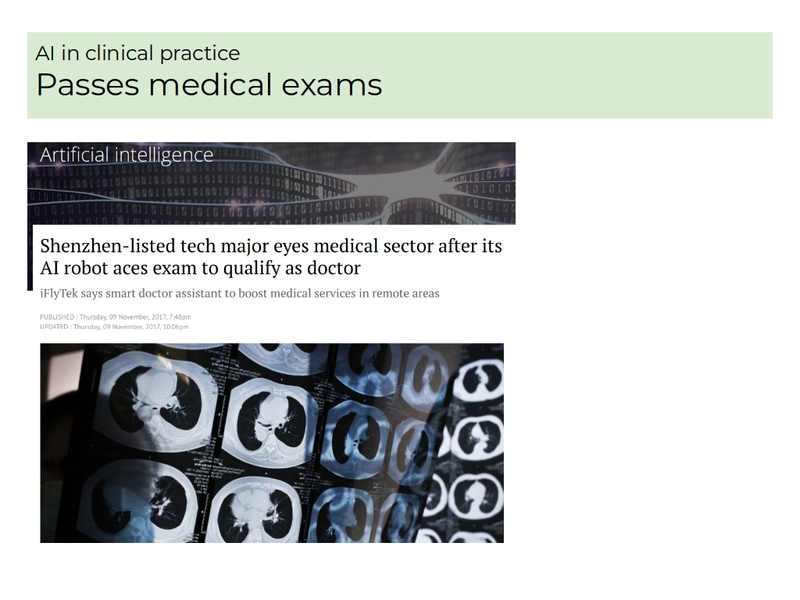 There is evidence to suggest that, while AI-based systems outperform human beings on many of the knowledge and reasoning tasks that make up clinical practice, the combination of AI and human originality results in the most improved outcomes of all. In other words, we may find that patient outcomes are best when we figure out how to combine human creativity and emotional response with machine-based computation. 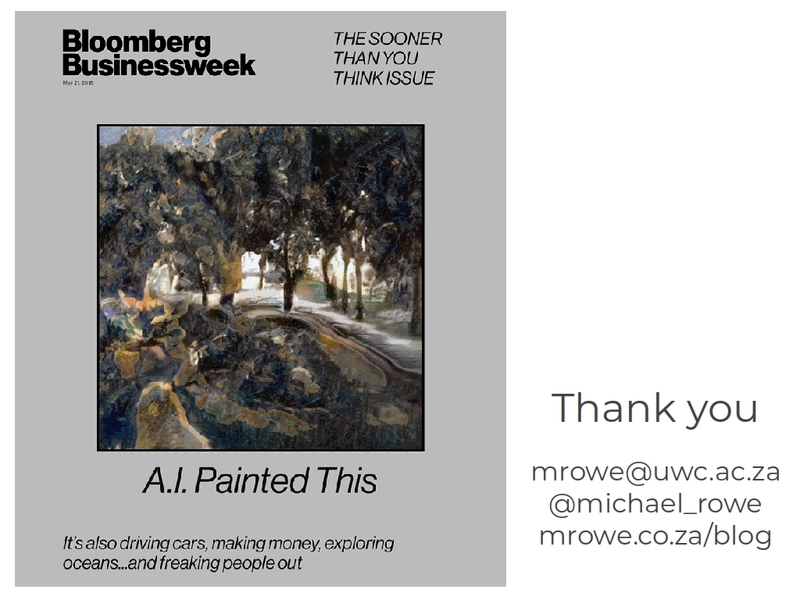 And just when we’re thinking that “creativity” and “originality” are the sole province of human beings, we’re reminded that AI-based systems are making progress in those areas as well. It may be that the only way to remain relevant in a constantly changing world is to develop our ability to keep learning.